Here's the Budget Babe's first look photos of the upcoming Matthew Williamson for H&M collection, which launches April 23rd at a select 200 stores. Another summer range for women and men is set to hit all 1,700 H&M stores sometime in mid-May. Yay! As much as I moaned and groaned about the high prices at the new Topshop in SOHO, I still have a lot of love for the UK fashion chain. Here's a photo of the snappy jean jacket ($80) and black pencil skirt ($55) that I bought on opening day, as well as the free reusable tote you get with every purchase. In keeping with the whole New Yorkers-heart-the-British theme, I added a cheery red scarf and shoes, both from H&M. 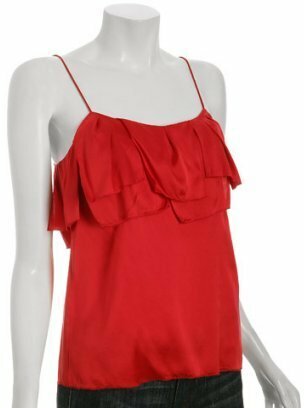 ...for a similar look, try this ruffle camisole by Forever 21 instead. 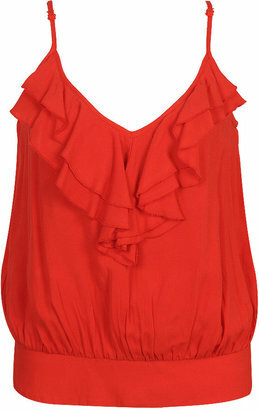 It has the same feminine allure as the Rebecca Taylor top, plus an even more alluring price tag of just $17.80.